Visuals from the blast site showed the mangled remains of the vehicle and a gaping hole on the road on which it passed before Naxals blew it up. TV channels flashed grisly images of body parts strewn along a road bisecting a forest and a vehicle reduced to a heap of metal. The powerful blast left a big crater in the middle of the road. The attack has been described a classic case of a complete intelligence failure. “It was a meticulously planned attack. 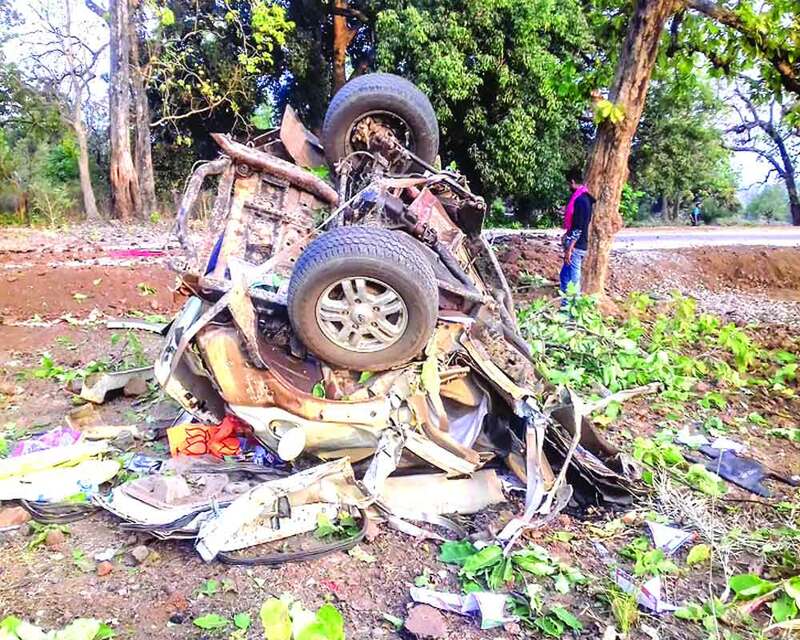 Maoists specifically targeted BJP MLA’s bulletproof vehicle when he was rushing to Nakulnar to address a public meeting in favour of the BJP candidate from Bastar, Baidu Ram Kashyap,’’ Dantewada police chief Abhishek Pallav told reporters at the blast site. He added that the BJP legislator was strongly advised against moving without foolproof security measures. The brutal killing of the Dantewada MLA triggered outrage in Chhattisgarh with Chief Minister Bhupesh Baghel putting off his poll campaign mid-way to chair a high-level meet to assess the law and order situation. Prime Minister Narendra Modi condemned the killing of “dedicated party worker” Mandavi and the police officials and said the sacrifice of those killed will not go in vain. “Shri Bhima Mandavi was a dedicated karyakarta of the BJP. Diligent and courageous, he assiduously served the people of Chhattisgarh. His demise is deeply anguishing. My condolences to his family. My tributes to the security personnel. The sacrifices of these martyrs will not go in vain,” he tweeted. The State unit of the BJP reacted angrily to the killing and alleged that State’s new Congress regime has nexus with Maoists. BJP national vice-president and former Chief Minister Raman Singh expressed shock over death of his party MLA and said Maoists were freely roaming in Bastar under the new Congress regime. “It’s a failure of State Government, I see a big political conspiracy in the killing because Mandavi was the lone BJP MLA from Bastar, situation is very pathetic in Bastar during Congress regime,’’ Singh told reporters in Raipur.